Economic importance: Very destructive to many garden plants and food crops. The decollate snail is predatory and helps to control plant-eating snails, although there is some worry that it will destroy the balance of native snails--but we doubt it. Organic control: Copper bands are supposed to work, but they sound like too much work to us. Dust dry hot pepper in problem areas - it works great. Mix with diatomaceous earth for economy. Coarse-textured, crushed hot pepper like as that used on pizza is best. Citrus oil spray works well, and coffee grounds sprinkled on top of the mulch also helps. The American Indians used them for food. Boiled or roasted snails were a staple in their diet. 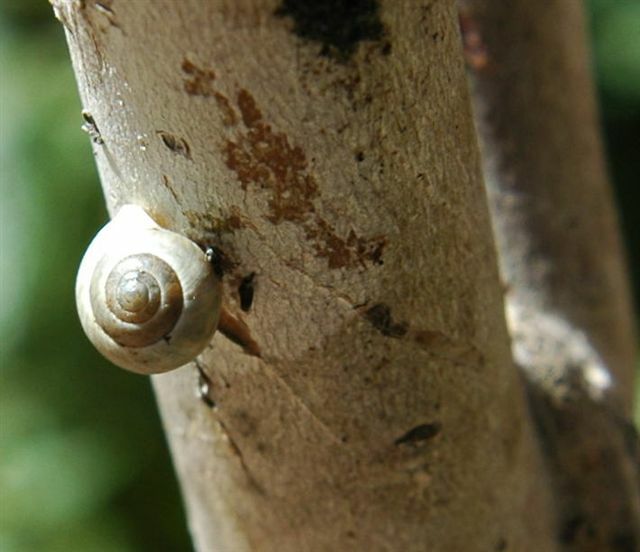 Rumia decollate is a predatory snail, imported from North Africa, and naturalized here in Texas. It grows to 2 ½ “, has a long conical shell and feeds on the round-shelled garden snail. It burrows into the soil in hot and cold weather and prefers to feed on snail eggs and small hatchlings. The decollate snail seems to do very little damage to crops unless plants are stressed and showing signs of decay and death. Decollates will feed on some low growing plants and germinating seeds, but they prefer dead plant material. Some people fear the release of non-native species, but they are already here. Economic Importance: Very destructive to many garden plants and food crops. The decollate snail is predatory and helps to control plant eating snails, although there is some worry that it will destroy the balance of native snails - but we doubt it. Natural Control: Maintain permanent stands of clover and mulches to favor ground beetles and rove beetles (which eat slugs). Centipedes also eat slug eggs. Other predators include small mammals, snakes, fogs, toads, lizards, birds, and carnivorous beetles. In the insect world their biggest enemy is the larva of the lightning bug. Slugs and snails hate caffeine, researchers have discovered. Robert Hollingsworth of the United States Department of Agriculture's Agricultural Research Service in Hilo, Hawaii, and his colleagues discovered this secret while testing caffeine sprays against the coqui frog, an introduced species that infests potted plants. They found that a 1 to 2 percent caffeine solution killed most ofl the slugs and snails in two days. Concentrations as low as 0.01 percent repelled the the pests. A cup of instant coffee contains about 0.05 percent caffeine, and brewed coffee has more. Coffee grounds can also be used to repell slugs and snails but a caffeine solution is much more effective. Caffeine is more effective against slugs than metaldehyde products. The United States bans metaldehyde residues in food, but classifies caffeine as safe. It may even qualify as organic, adds Hollingsworth.